Recently, Bradley Manning, the 25-year old private who released over 750,000 pages of classified U.S. military documents and videos to the website WikiLeaks, was found not guilty of aiding the enemy – the most serious of the 21 counts he faced. Specifically, Manning faced possible life imprisonment had he been convicted on this charge. Manning was also found not guilty of unauthorized possession of information relating to national defense. Manning was, however, found guilty of most of the remaining charges lobbed against him, including six espionage charges, five theft charges, computer fraud, and other military infractions. The judge, Judge Col. Denise Lind, also accepted two guilty pleas Manning had previously entered to two lesser charges. For all the various convictions, Manning faces over 130 years in prison. There is, however, no minimum sentence the judge must impose. Manning will return to court on Wednesday to begin his sentencing hearing. Considered the largest leak in U.S. history of highly classified government materials, Manning (since 2010) admittedly provided battlefield reports, diplomatic cables, and other confidential materials, including battlefield videos, to the disclosure portal, WikiLeaks. WikiLeaks published much of the material on its website, as did a number of major news sources. Some of the most infamous leaked material includes a video of a 2007 Bagdad airstrike which WikiLeaks dubbed “Collateral Murder.” As a result, Manning was arrested in 2010 and ultimately charged with 22 counts, including espionage and the capital offense of aiding the enemy. While Manning has awaited trial the past 3 years, the world has furiously debated whether his actions were that of a whistleblower or a traitor to his country. Manning himself has stated that he released the documents and videos because they had concerned him and he wanted to show the public the true costs of war. The prosecution, however, urged that Manning released the material to with an evil intent, knowing it would be seen by terrorists. 1. Precedent setting— the Manning case is a precedent setting one. 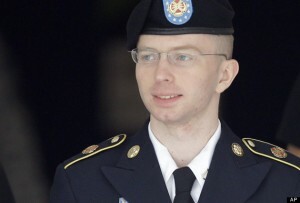 Manning was convicted under the Espionage Act for his leaks to the media, despite a lack of evidence that he had the intent to harm the United States. Some see this as a scary precedent for the handling of future secret sharers. On the other hand, his acquittal on the count of aiding the enemy serves to narrow the reach of that crime. Traditionally, the capital crime of aiding the enemy has been used to punish those who directly turn over secret material to the enemy, such as occurred in World War II when POW’s provided information to the Japanese. Legal analysts feared that if Manning were convicted on the charge of aiding the enemy for his actions, it would set dangerous new precedent because Manning did not directly place the secret material in the hands of the enemy. By rejecting the charge, Judge Lind appears to express a belief that the definition of the crime of aiding the enemy should not be expanded to encompass Manning’s behavior. 2. Chilling effect on whistleblowers— despite being found innocent of aiding the enemy, Manning still faces over 130 years imprisonment for his actions and has already spent 3 years in confinement awaiting trial, including a harrowing 9 months in solitary confinement. Manning’s arrest and conviction, along with the recent high profile charges against fellow secret sharer Edward Snowden, could potentially have a grave chilling effect on would be whistleblowers, secret sharing websites like WikiLeaks, and even major news media. The Bradley Manning case was a complex, precedent setting one which will likely be discussed by legal analysts for years to come. Whatever the nature or complexity of your charges, The Law Offices of David L. Freidberg can help. For over twenty years, David Freidberg has been defending individuals charged with all types of crimes, especially Chicago violent crimes. Mr. Freidberg can assess your case and determine the best possible course of action for you. To schedule a free consultation, contact us today at 312-560-7100. We’re available 24 hours a day, 7 days a week to serve your needs.